2019 Class Schedule! We will be offering 4 weeks of either basic obedience, intermediate and advanced obedience classes hosted by the K9 Development Dog Training Center or City Of Tracy Parks and Community Services. “Don’t blame them, train them!” Come on down and see how 4 weeks of training can enhance life for you and your dog! For more information please call 209-858-5134 or contact the City Of Tracy Parks and Community services at 209-831-6200 or through the link for the K9 Elementary school below. Private classes are also available! For new client training service or an existing client training service at the K9 Development Training center Click Here! Welcome to K9 Development. We are a full service dog training business located in Tracy, California. We were established in 1989 and have been successfully helping dog owners ever since. Our primary objective and basic philosophy is to help owners maintain a balanced relationship with their dog. We can help you in every step you take from training your current dog to choosing a new companion. We can help you train them to be responsible members of their families, and solve the inevitable problems that happen in any relationship. We use a wide variety of methods and are very good at working with the client’s individual needs. 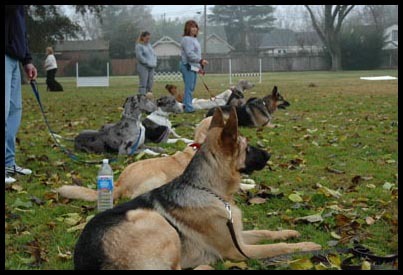 From Basic Obedience (loose leash walking, sit, down, stay, come, basic manors, relationship building and problem solving) to Top level Performance ( AKC obedience, Tracking, Schutzhund, and Conformation) or Working Dogs ( Police K9s, Personal Protection, Search and Rescue, Service Dogs, and Hunting Dogs). We have been established in the industry of dog training for the better part of 25 years so If We cannot do it then odds are we are in contact with someone who can. K9 Development offers a wide selection of canine related services from Professional Pet boarding to K9 Swim Lessons. If you have a want let K9 Development help show you the way.